Batcave Toy Room - Better Living Through Toy Collecting: Holy Smokes Batman! New Robin Site. Holy Smokes Batman! New Robin Site. A while back we posted a string of Robin's Holy phrases from the first season of the Batman TV series. It's called "Holy Smokes Batman!" and has a complete set of audio clips from every season of the show plus the 1966 movie. 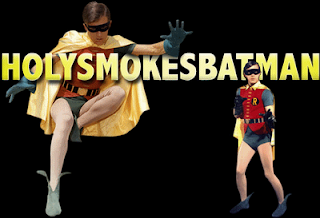 If you'd like to hear every "Holy..." spoken by Burt Ward as Robin The Boy Wonder check it out.